atomic fantasy: Hey, is that a Flamingo I see? Hey, is that a Flamingo I see? As long as we remain living in San Francisco it is highly unlikely that we will ever have a lawn. So us city dwellers had an unique dilemma. 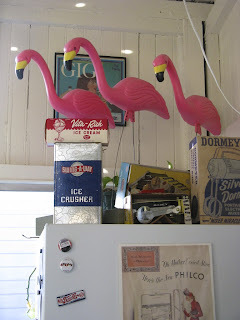 Where in the heck should we display our vintage flamingo lawn ornaments when the closest patch of green was cross town? And chances were - they would have been stolen if left unattended. And sadly, I doubt I could issue an Amber alert if they were kidnapped. So on top of our refrigerator seemed the most logical solution. 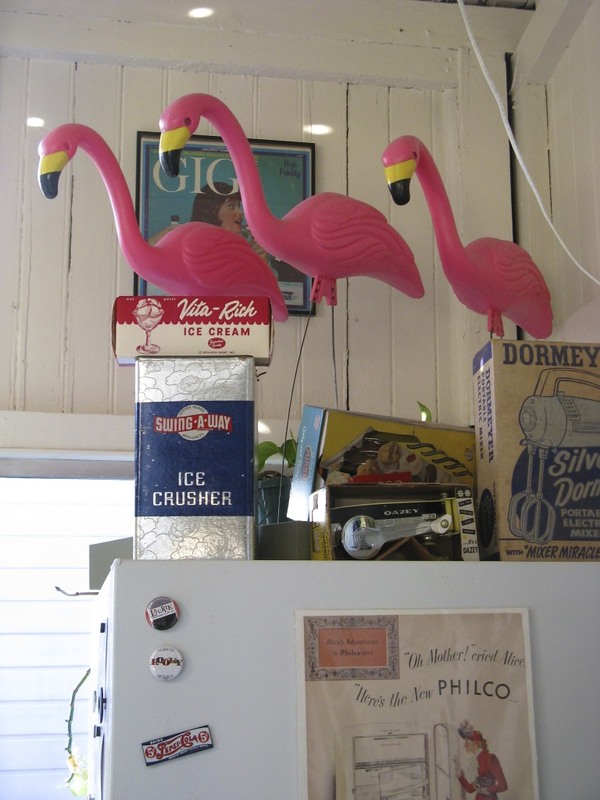 Surrounded by vintage advertisements, our three pink flamingos now truly have a bird's eye view of the apartment.